It's been an eventful couple of days, around the South Wales valleys, hasn't it!? 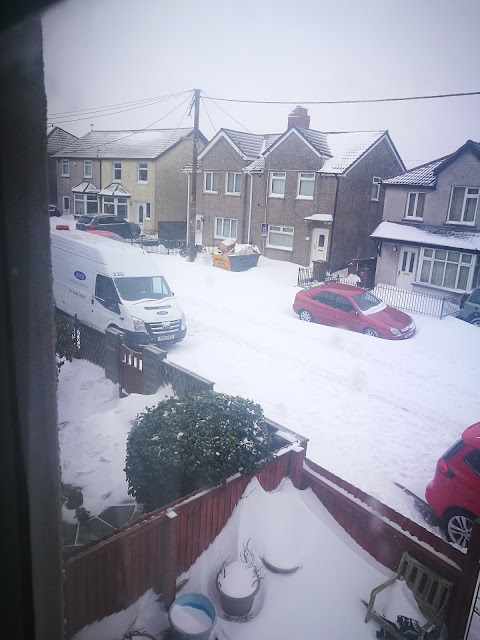 The 'Beast of the East' met storm Emma, right above us, and it has caused major chaos. Streets shut off, because of snow drifts. Some houses suffering loss of power or water, and that's just local to me! Excuse the quality, it was taken through a window, and was still snowing! In this house, of course, it's been a time of utter joy for one certain little boy. You'll read a lot about autism, if you choose to learn about it. My little Ajax is a child that's never happier than when he's at home, in his pants. Everything else stresses him out. He also doesn't like being in any room alone, his anxiety goes through the roof when that happens. So, as you can imagine, it's been a relatively relaxed few days. Something strange has happened to me though, I've found myself going a little stir crazy! It's not that I spend a lot of time out of the house, between Ajax and Mr. Ojo not being able to get about as much as he used to, I'm mostly at home. Even though this is generally my 'happy place', I've found myself missing leaving the house. I've missed the other parents, up the school. I've missed chatting to my friend that works in the local shop. I've really missed chatting to my neighbours, as I go back and forth, on the school run. I've even missed perusing the aisles, at the supermarket. I've REALLY missed my Slimming World class, that's my favourite day of the week! I've missed seeing my biggest the most, Sunday isn't right without him sat at the dinner table. I wonder if this is me, turning a corner? Autism rules our life, it probably always will. It rules where we go and how we go about it, most of the time, we simply don't bother. By the time I make sure I have all the stuff I need, in my bag, make sure his phone is fully charged, get the chair in the car, then explain 50 times where we are going, and why. Well, by then we're exhausted. Add to that, Mr. Ojo has certain needs that we have to consider, and I've got a teenager who would rather be in front of his PS4! It would probably only be for an hour, because that's how long Ajax lasts, before he starts asking 'when are we going home', and his stress levels start going up. Maybe it is worth the effort though, just a little trip to the library, or the nearest beach/pier. Anyway, that turned into a bit more of a ramble than I meant it to! I'm thankful that I have power, heat and water, I know I'm lucky and blessed to be surrounded by loved ones, and that my parents are the same. So I shall wait and see what this storm brings and look forward to leaving the house again. I hope you're safe, warm and well, wherever you are.